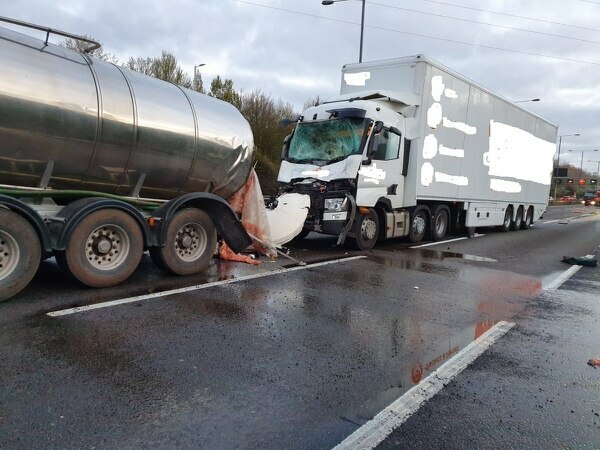 Drivers faced major delays this morning after a lorry and tanker crashed on the M6, spilling the tanker's load across the motorway. There were delays of more than an hour on the M6 southbound as a result, with three lanes closed at Junction 10 for Walsall. Traffic was backed up six miles to Junction 11 for the M54, with knock-on delays on the M54 eastbound after Junction 1, the A460 Cannock Road, the A449 and other nearby routes. All the lanes were reopened shortly before 10am, but motorists were warned delays were still likely. 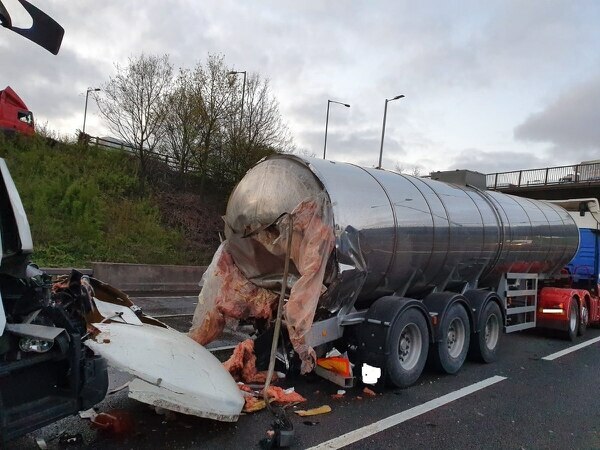 Nobody was seriously injured in the crash, which happened at around 5.30am and saw the front of a Whistl lorry collide with the back of a tanker carrying 28,000 litres of "low hazardous liquid" believed to be fertiliser. West Midlands Ambulance Service said they treated one of the lorry drivers at the scene, who was then taken to hospital. A spokesman said: "On arrival ambulance staff two lorries that had suffered considerable damage. Both vehicles suffered major damage, with photos taken at the scene showing liquid pouring out of the crumpled back end of the tanker in the outside of two middle lanes inside Junction 10. Specialist police, paramedics, firefighters and Highways England officers were all sent to the crash and the vehicles were being recovered at 8.30am. The southbound route was initially fully closed inside the junction, with vehicles diverted up past the scene and back onto the motorway, but traffic is now passing the crash via the inside lane. All lanes reopened shortly before 10am. A Highways England statement said: "The M6 currently has delays of at least one hour between between its junctions of 11 (M54) and 10 (Walsall), covering several miles of the southbound carriageway. "The delays are due to a road traffic collision with three lanes closed within Junction 10 and Highways England has resources deployed working hard to restore normal conditions as soon as possible. "For traffic approaching the delays locally, you are advised to expect disruption with extra journey time and you may wish to re-route or delay your journey. "If travelling towards this area from much farther afield, you may wish to change your strategic route, allow extra travel time and follow guidance from our on-road variable message signs and media. 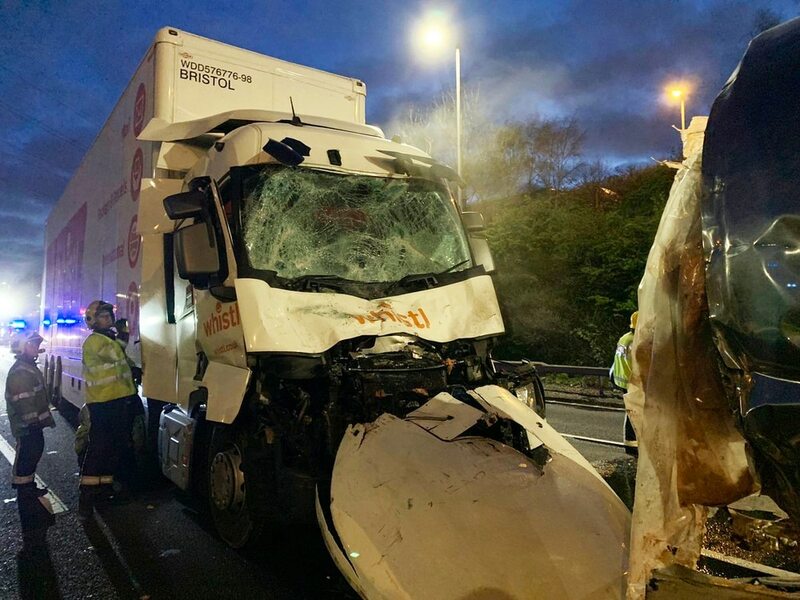 "Highways England has been working closely with our emergency services colleagues Central Motorway Police, who led the response to this incident." Further down the M6, all lanes southbound are back open between Junction 7 for Great Barr and Junction 6 Spaghetti Junction after a crash shut one lane at around 8am. Traffic is also heavier than normal in Wolverhampton, with major congestion on the A449 Stafford Street heading into the city centre.